A lot of people would say that a cold beer hits the spot, but a warm beer is a sad disappointment. Unless you want to drink your beer in one second, it can be hard to keep it cold once it is taken out of the fridge, freezer, or Yeti coolers. An answer to keep your beer cold? A beer koozie. A top rated beer bottle cooler can envelop your beer in a layer of protection that helps retain the cold, block out the sun, and minimize the absorption of heat from your hand. An insulated beer koozie can do the hard work for you, so you can sit back and relax with your beer. 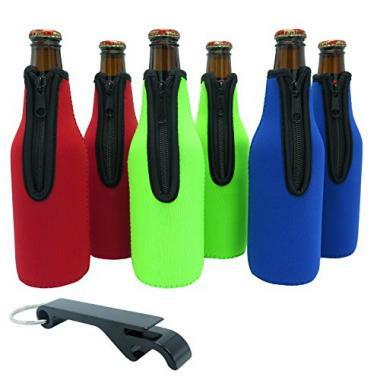 Like a lot of popular products today, there are many different beer bottle insulator designs. It can be hard to decide on which one you would like best. Our list gives you the top 10 choices of the best beer koozie designs to keep you cool and refreshed throughout the summer. This is a hard sided beer can cooler that has a unique DuraCoat finish that ensures it won’t fade, peel, or crack. It has a load and lock gasket, which secures your drink in place. It has double wall insulation to keep your beverage frosty. The DuraCoat also ensures that it has a no sweat design and keeps your grip solid. You won’t have slippery or frostbitten hands. It can hold a standard 12 ounce bottle or can. This product is great for fishing. 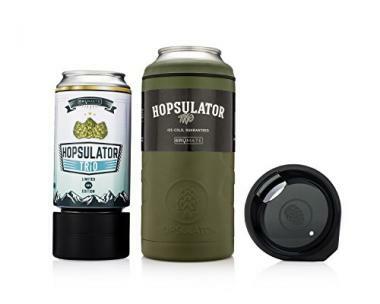 This is a unique and versatile design that can hold 16 ounce cans, 12 ounce cans, or a full pint glass. It uses an artic adaptor that is filled with a freezable gel to fit 12 ounce cans. It will keep your can 5 times colder than the competition. It uses double wall vacuum insulation to keep your drink cold to the last drop. It also comes with a Lifetime Warranty. This product is great to have a fun day at the beach. 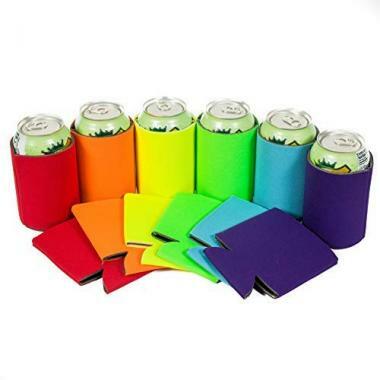 This is a set of 12 beer can coolers that come in a rainbow of solid colors. They can be used for any standard cans or bottles that are 12 to 16 ounces. They are fun and unique and are perfect for backyard BBQs, birthday parties, camping, picnics, and more. QualityPerfection also include their 100% Money Back Guarantee. This product is great for any types of camping. 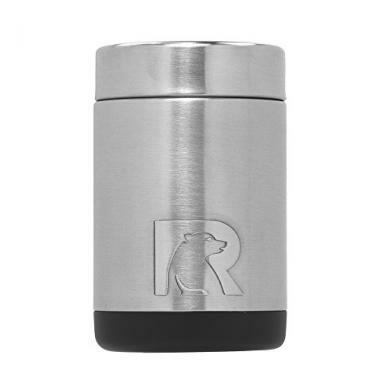 This is a hard sided, stainless steel can insulator for 12 ounce cans. It uses vacuum insultation technology for maximum temperature retention, whether it is hot or cold. It has a durable stainless steel interior and exterior. It can keep your beverage cold 10 times longer than the bare can material. It has a sweat proof design that won’t leave water rings on furniture. It will keep your drink cold for up to 3 hours. This product can be used for car camping. This beer bottle insulator is the go-to for beer bottles. 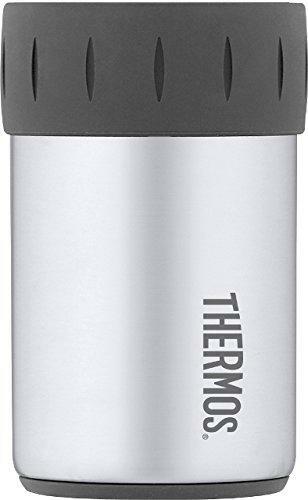 It uses vacuum insulated double walled stainless steel to keep your beverage cold. It has a no sweat design and guarantees a cold beer for hours. It is complete with a built-in beer bottle opener. It is the perfect size for any beer can or bottle and fits in most standard cup holders. This product can be one of the great gifts for boaters. 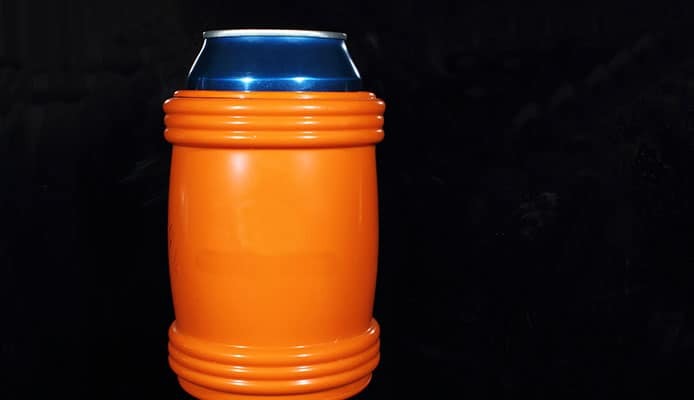 This beer can cooler design uses vacuum insulation with a locking gasket to keep your can cold. It fits a standard 12 ounce can or bottle. It is constructed from premium grade 18/8 stainless steel. It is non-toxic, non-leaching, and BPA free. It is also easy to clean. This product would be great to go sailing. This original design is the real deal. It eliminates the hate for a warm beer and broken bottle. 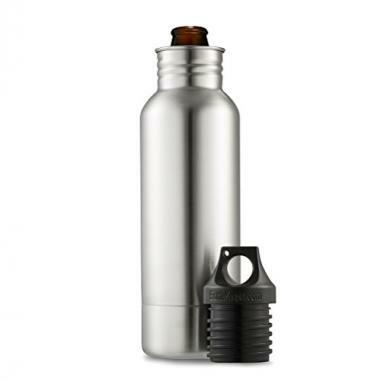 It is made of stainless steel and keep your beer bottle colder for longer. It is lined with neoprene and padded for impact. 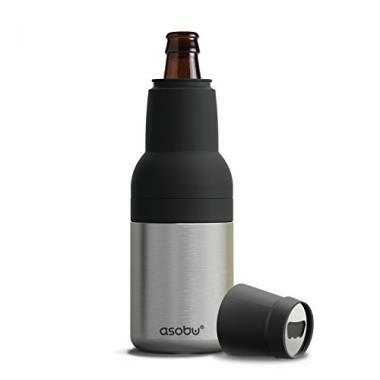 The cap seals the beer bottle as you close it. It will fit a variety of standard 12 ounce bottle designs. BottleKeeper also includes their Lifetime Warranty. This product is great for beach picnics. 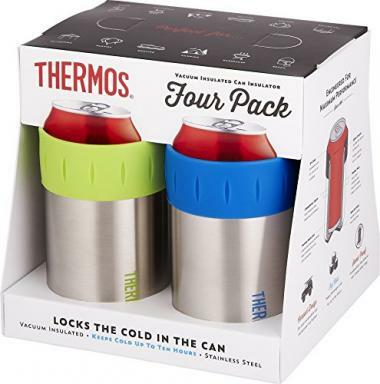 If you like the Thermos design but want to invest in more than one can insulator, this is a set of 4 that comes in multiple colors. These beer can coolers are popular with beer koozie reviews with a consistently high rating of 4.5 stars. They use vacuum insulation to provide maximum cold temperature retention. It can keep your drinks cold for up to 10 hours. They have a rubber grip that is comfortable and easy to hold. A non-slip base ensures no slipping or scratching. A silicone ring secures the can. It will fit most automobile cup holders. This product is great for a day spent cooking at the beach with friends. These sleeves are made of thick neoprene and have stitched fabric edges. It comes with a set of 6. They have a unique zipper design to easily put on and remove the sleeve. They are durable, sealed, and have zig-zag stitched seams. These will keep your drink cool in all temperatures and keep your hands dry. You can personalize these sleeves using waterproof markers or heat transfer vinyl. This product is a great addition to your paddle board fishing accessories. These Beer Bottle Cooler Sleeves will keep your beer cold and your hands warm. They are premium quality. 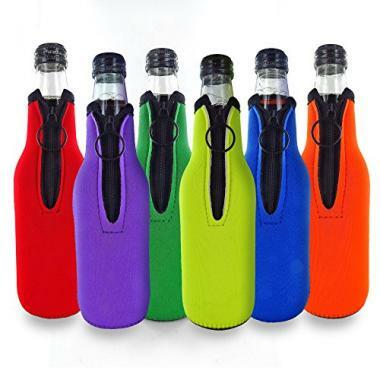 They come in a variety of 6 bright colors that will help you instantly identify your drink. They use premium wetsuit neoprene that is extra insulation, strong, and folds easily to fit in a pocket or purse. It is made of durable material that ensures a long life of use. Play Platoon also includes their Lifetime Replacement Warranty. This product is great for a motorcycle camping trip. The great thing about cool can koozies is that they can be used virtually anywhere. 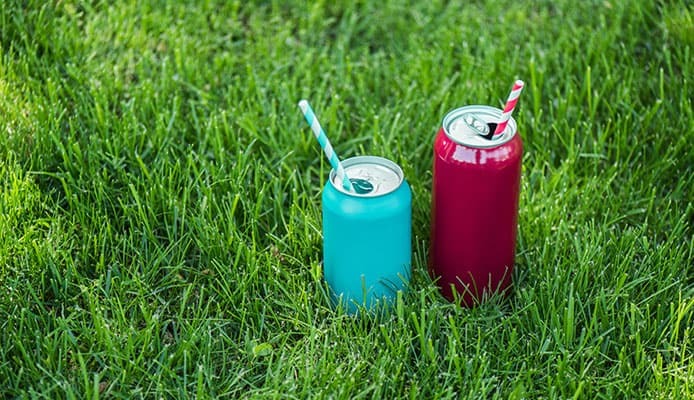 Whether you’re relaxing in the sand with beach coolers, at a game with soft coolers, relaxing in your camping hammocks, drifting in pool floats, or just relaxing in the backyard on your outdoor patio furniture – a beer can cooler can be easily stored alongside your other gear. However, there are some different designs and features that you should consider before you make a purchase, or you may find that there are a few different designs that you would like to invest in for different situations. Whether you use a beer bottle insulator or a beer can cooler, you will want the best beer koozie design. Here, we have listed some important features for you to consider. As well, we’ve provided all the information you too to finding a top rated beer bottle cooler that will keep your beverage frosty and cold, even in the intense summer heat. The size of the koozie will mostly refer to how snug it is around your beer can or bottle. The more snug the fit, the better the awesome koozies will do their job at insulating your beer. You will want to ensure that your unique koozies fit the bottles or cans for which you are intending to use them. There are a lot of different designs that you can choose from. You may even want to start a collection because you see a new and exciting design. No one will blame you if you choose to invest in more than one koozie. There are a lot of awesome koozies that have different styles, colors, and patterns. You should have no problem finding unique koozies that fit your needs and your style. There’s plenty to choose from. There are a variety of materials that are used in beer bottle insulator and beer can cooler designs. Some are hard sided, and others are soft sided. The best materials tend to be stainless steel and neoprene, as they are the most insulating. Neoprene is often known for being the material of wetsuits. Wetsuits are commonly used in activities like scuba diving or surfing, to keep the human body insulated against cold water. Cool can koozies work opposite when used to insulate your beer. Rather than keep the cold out, it keeps the cold in. Neoprene is a soft, but durable material. It would save you space because it can be squished down for storage or transportation. It’s a reliable material that will definitely keep your beer insulated. If you want to go for style, perhaps a stainless steel insulated beer koozie would suit you better. These types of koozies would be hard sided. Stainless steel is also a great insulating material, but you would lose the ability of collapsibility for storage or transportation. It will up to you to decide which material would best suit your needs. Aluminum and polyester may also be used in cool beer cozies, but they won’t be as effective at keeping your beer cold. They also tend to have more problems over time and aren’t as long lasting as neoprene or stainless steel. Insulation is key because it is the main job of what a koozie is used for. If a beer can cooler or beer bottle insulator isn’t insulating, it’s a waste to invest in the product. The cool beer cozies use insulation to keep your beer cold. Insulation works by keeping the cold inside of the bottle and minimizing the penetration of heat on the outside of the bottle. The heat will come from two sources. The outside environment may be hot, and your hand is hot. A beer koozie will ensure that every time you pick up your beer or place it down, the heat won’t get to your beer. Durability is important if you want to use your beer can cooler for a long time. It would be a bummer if your koozie broke after the first use or wore down after only a few trips. A durable insulated beer koozie will be able to be used throughout the years, on a variety of trips. If you accidentally knock over your beer, a soft sided beer koozie may not have any problems, but a hard-sided beer koozie isn’t flexible. A durable beer koozie should survive a few knocks, spills, or tips without being damaged. Q: Why use a beer koozie? A: If you enjoy cold beer, you know how frustrating it can be as your beer slowly warms over time. A beer koozie will keep your beer cold while you sip it. They are versatile and can be easily added to your camping gear or any other gear. You can use a beer koozie on a variety of trips, whether you are in the wilderness or your own backyard. While beer koozies are popular, they aren’t extremely widespread for use at parties or on trips. If you have a beer koozie, they can also help you identify your beer. Even if others have a beer koozie, because of all the unique designs, chances are your koozie will stand out. This can work as a marker to ensure that you can always find your drink. Beer koozies can also be used for a variety of beverages, not just beer. Check out the beer koozie reviews to see how all the buyers have used their designs on a variety of beverages. They can also be used for a variety of activities. Q: How insulation works in beer koozies? A: A beer bottle insulator uses insulation to keep your beer cold. This means that is insulates your beer to keep the cold inside of your bottle, rather than leaking outside. It also works to keep outside elements from reaching the cold beer inside. The biggest reason why beer warms is because of the outside temperature and the heat from your own hand. Insulation works to ensure there is a protective layer around your bottle, which means you can’t heat the bottle with your hand, nor can the hot elements. The cold will stay inside the bottle better with this layer of protection, which keeps your beer colder for longer. Q: How to wash a beer koozie? A: This will be depending on your unique koozies and the materials that they are made of. 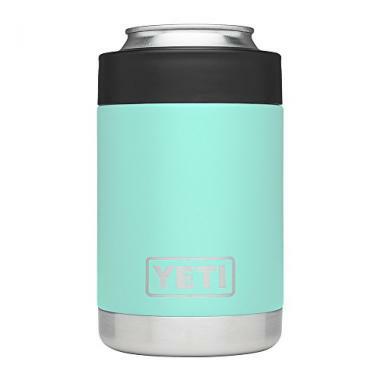 Soft sided koozies that are made of materials like neoprene, should be able to be hand washed or spot cleaned with a mild detergent and warm water. Hard sided beer koozies should withstand being hand washed with a dish cleaning agent and warm water. You should always ensure that your beer koozie is 100% dry before it is stored away to prevent mold, rot, or mildew. If you are worried about cleaning your beer koozie, there should be brand instructions for the care and maintenance that are included with the purchase, which would be specific to your unique koozie design. If you like to stand out and like your beer cold, a top rated beer bottle cooler is the best product to invest in. The best beer bottle cooler will keep your beer cold for long periods of time. They can be easily removed and applied, so you can sip a few beers and relax. If you know exactly what you want or need, you can save time and money by investing in the best beer koozie design. Do you own one of the beer koozies that made it onto our list? Let us know how it has worked for your beverage needs in the comments section below.